Conglomerate and vertical effects of acquisition-led growth: The case of retail giant, Steinhoff — CCRED - A leading university research group. The recent collapse of Steinhoff International Holdings (“Steinhoff”), a global retail giant, raises concerns around the interest and strategies of large corporates. Steinhoff has sparked controversy over “accounting irregularities”, which cost the retail giant R282 billion in stock market value. The company has at least 200 subsidiaries and affiliates - a tremendously complex structure which has contributed to distorting the nature and extent of its financial undertakings. A well-publicised report by Viceroy points out that Steinhoff has been in the business of acquiring retail companies with deteriorating financials, which are then used to obscure losses and overstate its financial position. Steinhoff’s aggressive and rapid merger and acquisition-led growth, which we focus on here, also raises competition concerns relating to conglomerate effects and vertical foreclosure theories of harm. Conglomerate mergers and acquisitions are defined as those involving firms operating in different, but related product markets, generally sold to the same set of customers. Conglomerate mergers can be characterised by both product and geographic diversification. Vertical mergers on the other hand are those between firms that operate in different but complementary levels in a value chain of the same final product. With over 40 retailing brands in 30 countries, Steinhoff has over the years become a significant player in the European, North American and South African furniture and general merchandise markets. The company has stakes in several South African retail companies such as JD Group (which includes Russels, Bradlows, Hi-fi Corporation and Incredible Connection), Pep Stores (its largest single brand retailed in southern Africa), Shoe City, Ackermans and Hertz Car Rental, amongst several other brands (Table 1). More recently, Steinhoff’s acquisition of US mattress retailer, Mattress Firm, paved the way for the company’s entry into the US market, making it the world’s largest bedding giant, whilst the acquisition of Tekkie Town expanded the company’s retail presence in footwear. 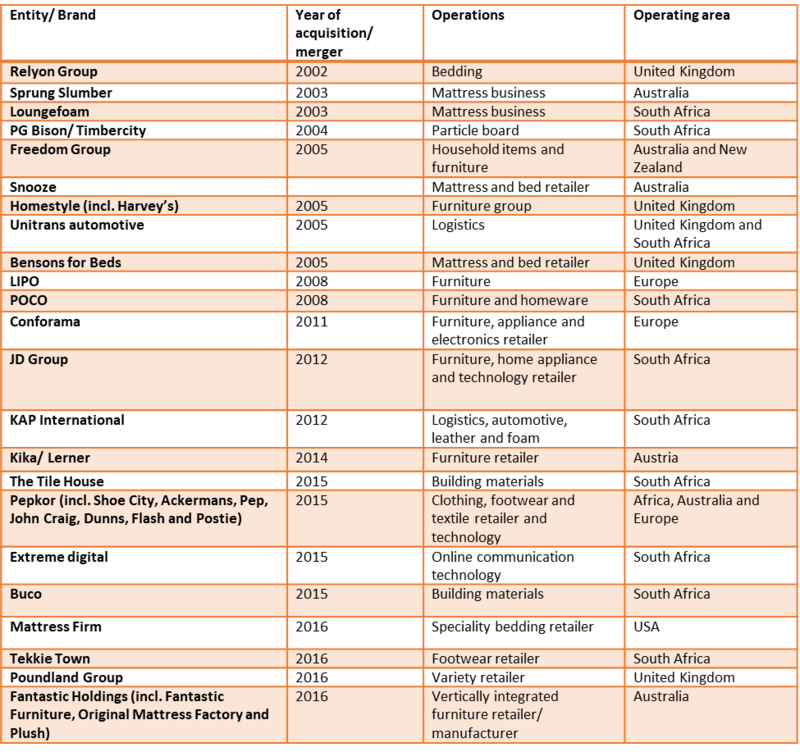 Table 1 shows the heterogeneity of Steinhoff’s acquired and merged entities, both in terms of products and geographic markets. Of importance here are the effects of conglomerate mergers which take place across different markets, business activities or geographic areas. Steinhoff’s acquisition of Pepkor in 2015, for example, diversified the furniture retailer’s portfolio by moving into clothing, footwear and even mobile technology. Although a merger in a neighbouring market generally has indirect or sometimes no effects on competition, the existence of common buyers across these markets raises competition concerns of possible foreclosure. A significant degree of commonality in terms of buyers can result in anticompetitive practices which in effect harm consumer welfare. In the Steinhoff portfolio, buyers of furniture, for example, are likely to be buyers of homeware appliances. The effects of vertical mergers discussed below are likely to be more significant. Nonetheless, in the context of conglomerate theories of competitive harm a merged entity can strengthen its market position by means of tying or bundling products. Conglomerate mergers can therefore facilitate exclusionary practices in order to obtain more consumer surplus from the purchase of separate goods. The desire to gain or protect market power through tying or bundling of complementary products curtails the demand for products of competing rivals, who end up becoming less effective competitors in the long run. For instance, a Steinhoff entity may sell a bed frame on condition that a buyer purchases a mattress with it. Here the incentive to bundle arises because the two products are complements and more valuable to the buyer when consumed together. Customers may therefore only care about the combined price. In 2011 the Competition Tribunal recognised that the merger of Steinhoff and JD Group could potentially incentivise the merged party to engage in the practice of tying/bundling. In essence, while a conglomerate merger creates a new portfolio of products (as in the Steinhoff case) allowing for customers to reduce their transaction costs by “onestop shopping”, it also allows a conglomerate to bundle its products and potentially increase prices or reduce output and hence reduce consumer surplus. Over the years, Steinhoff’s strategy shifted from building economies of scale (through for example, consolidating its European footprint) to vertical integration, by carrying out vertical mergers and acquisitions. A large portion of Steinhoff’s South African operations are in furniture manufacturing, along with an established retail presence to complement its manufacturing capacity. However, the company is also significantly vertically integrated with substantial interests in raw material. Through its acquisition of KAP International and PG Bison (Table 1), Steinhoff is afforded access to key inputs such as leather and particle board materials. Its purchase of Unitrans also increases downstream capabilities in logistics. As such, through acquiring a string of inputs, furniture manufacturers, transport and forestry companies, Steinhoff is well integrated in the South African market just as it is in Europe. Steinhoff’s purchase of US bedding company Sherwood and later Mattress Firm followed a similar strategy, creating distinct areas of profit along the value chain. Vertical mergers do have potential to create efficiencies. One key aspect of this is that it gives the company some level of flexibility in terms of ease of sourcing manufacturing inputs by leveraging the groups’ buyer power as well as efficiently moving goods across the globe (through its 50 distribution centres in Europe). In the theory, the internalisation of extra margins that would be paid to unaffiliated companies in the value chain, potentially enables the vertically integrated entity to lower its costs and in some cases pass through these savings to consumers. Importantly, however, extensive vertical integration increases the potential for foreclosure of rivals at upstream and downstream levels of the supply chain. Under certain circumstances vertical relationships between activities can also increase the likelihood of collusion between firms in the relevant upstream or downstream market. Coordinated effects of mergers are created or strengthened if a merger reduces competitive constraints in a market, which then facilitates coordination of competitors. This anticompetitive behaviour may include coordination on price or output, or market allocation. In 2007 for example, a complaint was brought against manufacturers and sellers of flexible polyurethane foam (including Steinhoff and some of its subsidiaries - Loungefoam and Vitafoam) for allegedly colluding in setting prices for the chemical input that goes into the manufacture of this product for furniture, automotive finishes and industrial applications – all market segments which Steinhoff is currently active. Labelled as the “chemical cartel” the firms reached an agreement to fix the purchase price of certain chemicals and polyurethane foam. Loungefoam and Vitafoam (both controlled by Steinhoff) also allegedly divided markets amongst themselves, by allocating customers, suppliers or markets for specific goods and services. The two companies stated that because they were both controlled by Steinhoff, there cannot be collusion within a single economic entity. The case was concluded with a settlement agreement with KAP Raw Materials (a subsidiary of KAP International owned by Steinhoff) in 2016. The expansion strategies of large firms raise questions about possible regulatory gaps and the need for more vigorous oversight of corporate structures, as well as a role for independent regulators. The Department of Trade and Industry, in December 2017, said it would launch an investigation, together with the Companies Intellectual Property Commission (CIPC) and the Independent Regulatory Board for Auditors (IRBA), to look into Steinhoff’s compliance with companies’ law following its corporate governance failures and irregularities. But beyond Steinhoff’s model of obscuring company losses within its subsidiaries and other financial irregularities, it is important to consider the incentive behind acquisition-led strategies as this also has implications for competition in different markets. As stated above, the various cross-ownerships and extensive vertical integration can lead to foreclosure of rivals and possible collusion (or reduction of competition) between Steinhoff’s related entities. Given the more complex merger transactions involving conglomerate entities, competition authorities would need to consider multiple theories of harm (and possible creeping mergers effects once the provision comes into effect). A careful approach needs to be taken in assessing the possible exclusionary effects of conglomerate and vertical mergers on competitive outcomes, given possible efficiencies which arise as well. This has implications not only for the Steinhoff case, but the consideration of mergers and acquisitions by other large conglomerate groups such as BidVest, Remgro and Imperial Holdings in South Africa. Recent evidence from CCRED research points to the fact that many large food production groups have also grown extensively through acquisitions rather than investment in new productive assets. It is therefore important to consider the long-term effects of mergers which can result in concentrated markets and a lack of inclusion and dynamism in the economy in the long-term.